National Review Online wasted no time in sending this bizarre Post-Primary Valentine to John McCain. Alexis Levinson, no doubt with a substantial dose of No Doz, posted an article at 4:00 am and quoted GOPe Maven Charlie Black, “John [is] the best campaigner in the state and he could raise unlimited money if he needed to.” Black’s rosy assessment may bring the reflexive nods of the Washington insiders and Establishment types, but Arizonans know better. First, McCain could NOT raise unlimited funds for the 2016 GOP Primary. The only way he came up with $30 Million to defeat JD Hayworth in 2010 was to take advantage of a campaign finance “loophole,” and raid the Taxpayer Matching Funds in the 2008 Presidential Campaign Fund. The irony of the one-time Champion of Campaign Finance Reform (“This money corrupts us all,” he said in 2000), exploiting a technicality to tap into the treasure of government subsidized largesse demonstrates the cockroach-like survival skills of Arizona’s senior senator. McCain, devoid of principle, has a pathological need to remain in power. Still, he raised what was needed to run another TV campaign this time around. Secondly, “Geriatric John” is NOT the “best campaigner in the state.” That distinction belongs to yesterday’s second place finisher, Dr. Kelli Ward. Though she was unable to raise the funds needed to win; she carried some of the rural counties and finished with a higher percentage of the vote against McCain than Hayworth did in 2010. Moreover, she did it with a pair of “McSpoilers” on the ballot. As noted here before, Alex Meluskey deserves no accolades for his late withdrawal; in fact, he suspended his campaign only after the ballots were printed — guaranteeing his presence would do the desired damage to Ward’s viable challenge. And, what to make of “Van the Radio Man,” Clair Van Steenwyk? As in sitcom plots of old, it appears that “Van” picks up a radio signal through previous dental work — but unlike those black-and-white screenplays, only Van hears the message, and it always tells him: “Run…Run…RUN!! !” This year, he outdid himself, making the senate ballot, while simultaneously challenging Rep. Trent Franks for congress. Such feverish activity must make 2010 “McSpolier” Jimmie Lee Deakin scratch his balding pate in confusion. If Deakin had only petitioned a run for Congress as well as the Senate, maybe “McFunds” could not only have helped pay the mortgage on his foreclosed residence, but finance a Pinetop vacation home as well. Now, the Legislature must pass a “Van Steenwyk Law,” spelling out in no uncertain terms that candidates can only run for a single office at a time. Of course, if it does so and Gov. Ducey signs it, don’t look for the Secretary of State to enforce it. Michele ( I am in no way like Ronald) Reagan has ridden her maiden name to electoral success for over a decade. Unfortunately, her victories at the ballot box have not enhanced her humility. 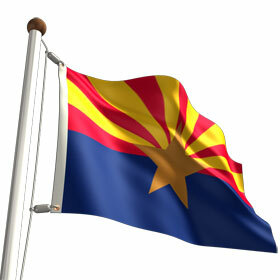 In fact, she has developed an arrogant disdain for the voters that mirrors the mindset of Arizona’s two U.S. Senators. Perhaps that’s why she engaged in such transparent aid to the McMachine, announcing that her office would NOT enforce the anti-ballot harvesting law now on the books in Arizona, opening the door to a ballot harvesting operation employed by Team McCain Tuesday. That non-enforcement stance was also assumed by Maricopa County Recorder Helen Purcell — but unlike Reagan, Purcell’s name was on the ballot yesterday — and she paid the price for her declared adherence to laxity. Her challenger Aaron Flannery prevailed. Accuracy compels us to note that it was not only Purcell’s non-enforcement, but her clueless approach to the earlier Presidential Primary that had voters waiting in mile-long lines, that ensured her political demise. Purcell stayed too long, but in a sense, you can’t blame her. After all, McCain wore out his welcome long ago, but still prevailed yesterday for the reasons outlined above. The same Democrats who reverently and repeatedly mentioned McCain’s name during their National Convention will take a more conventional approach and spend big to put an actual registered Democrat in the senate instead of an inconsistent one. Conservatives should display the same interest in the outcome of the November senate race that McCain has shown them for all these long years: NONE. Unfortunately, the AZ GOP remains the “McMachine.” It may take a Democrat senate win to start the process of real reform. That and a credible challenge to smirking Sen. Jeff Flake as well as problematic Secretary of State Michele Reagan in 2018. Some vote totals in last night’s primary election races remain incomplete. If you ran for precinct committeeman those numbers aren’t yet available. Since McCain operatives were once again working on his behalf, using deceptive practices to remove conservative PCs, you’ll have to wait to see if you’ve been purged. So there! category: Popular Sheriff Joe Arpaio’s enormous 66% victory over nearest Republican competitor Dan Saban who carried only 26% of the vote. Arpaio’s triumph is more than the lopsided percentages. He prevailed despite contemptible daily assaults from the leftwing Arizona Republic and the relentless punitive measures taken against him and his chief deputy by Judge Murray Snow, who persists despite the fact that a personal conflict should have caused him to recuse himself from the case. Sheriff Arpaio’s runaway victory attests to the fact that the people are fed up with the overbearing judiciary, which previously conducted itself in a judicious manner and was held in esteem..Judge Snow, who suspiciously timed forwarding his bogus case to the feds to coincide with this election, personifies the current contempt many have for the judiciary. Question with no sensible answer: How did Dr. Kelli Ward lose to the deceptive John McCain? In his Tuesday night acceptance speech, McCain engaged in code talk and thanked his “coalition.” Translation: Out of state, deep pocket, lobbyist backed PACs willing to spend $ millions to lie about Ward’s support of ISIS terrorists, allegedly based on votes as a state senator, where national security is never on the agenda. Those votes take place in D.C. where McCain has spent close to four decades. Democrat Ann Kirkpatrick won last night with nearly 33,000 votes more than McCain. A mailer he sent out recently said he would safeguard our conservative Arizona values. How would he know a conservative value? Unhappy surprise: Congressional District 5: Christine Jones’ single percentage point win over Senate President Andy Biggs, an intelligent and well-respected conservative who knows how to herd cats. Welcome upset: Conservative educator Jana Jackson beating incumbent Don Covey in the race for Maricopa County School Superintendent. ERROR: Steve Watson was the winner in the Republican Primary. Running as a team? : The dual losses of Al Melvin and Rick Gray stand as proof that the other fella might not do you a favor. The duo came in last in a field of five where three Corporation Commission were being selected. Bob Burns, who waged war on “dark money” spent by utilities to influence commissioners, Andy Tobin and Boyd Dunn were the victors. Time‘s up: Longtime Maricopa County Recorder Helen Purcell will be replaced by Aaron Flannery, who has run a respectful but assertive campaign, calling out Purcell for the snafus on the day of the presidential preference primary where too few polling places left people standing in line for up to 6 hours to cast their ballots. Jerk replaced by quality: Desert Ridge JP Clancy Jayne was trounced by the very capable Cathy Riggs, a former police detective and law school grad with a BA in Administration of Justice, who exposed Jayne’s numerous reprimands by the Arizona Commission on Judicial Conduct. When Gov. Ducey endorsed Riggs, Jayne let go with a barrage of foul mouthed utterances that should enable him to find employment with John McCain, renown for his own crudeness — even publicly directed at his own wife. Best resurrection from scandal: Congressional District 1: Pinal County sheriff Paul Babeu easily won the GOP Primary, overtaking five challengers. Ken Bennett’s dismal 4th place showing should keep him out of the political arena in the future. Babeu’s previously much publicized romance with another male is of no consequences in this age of Kaitlyn Jenner. His Democrat challenger, also out of the closet, is the recipient of donations by the Gay& Lesbian Victory Fund. More evidence of the lack of influence of the Arizona Republic: Though the newspaper endorsed his primary challenger, conservative Congressman Paul Gosar easily captured 71% of the vote. No surprises: CD 6 incumbent Republican David Schweikert won with 80% of the vote. CD 8 incumbent Republican Trent Franks won with 71% against Clair VanSteenwyk who simultaneously was in the U.S. Senate race. Can’t something be done to keep egotists from running for more than one office at a time? Biggest loser not on the ballot: Secretary of State Michele Reagan whose job it is to oversee statewide elections failed miserably with her new “Error” plagued website That word popped up instead of the candidate names and vote totals Arizonans were looking for. More proof that even this age of technological advances, the old adage, “if it ain’t broke don’t fix it” still applies. AZ 2016 Primary election results? We’ve got what you’re looking for! 8:48 PM: Having trouble accessing the Secretary of State’s Primary Election results? So is everyone. 3 TV News is reporting the website is malfunctioning. They just interviewed the flustered Secretary of State Michele Reagan, who is clearly in need of her own SOS help. She desperately needs a life jacket. For up-to-the-minute 2016 statewide primary election results CLICK HERE. Maricopa County election results will be available HERE. Polls close at 7:00 p.m. on Election Day. Election results will be available after 8:00 p.m. The Secretary of State’s Office recently redesigned its website. The results are disappointing, as the first office shown, that of U.S. Senate, is accompanied by the word “FEATURED” in all caps. Whose pictures appear? Prominently positioned is John McCain. Directly across from him is Alex Meluskey, who sent out a video July 31 announcing the suspension of his campaign. At this point there is at least an appearance of impropriety, though the people at the SoS’s office claim this will all vanish as the votes begin coming in. In order to see McCain’s front-and-center challenger Kelli Ward, or even Van the Radio Man, the “more details” button positioned next to Meluskey’s head must be pushed. If this website is a redesign, it obviously isn’t intended to be impartial. Make plans to see and hear GOP Presidential candidate Donald Trump and VP candidate Mike Pence at the Phoenix Convention Center, tomorrow — Wednesday Aug. 31. Doors open at 3:00, event begins at 6:00 PM. Reserve your tickets HERE. Space is limited. Breitbart reports the good news as we greet this Primary Election day. According to the latest polling from Breitbart News Network and Gravis Marketing, John McCain, who celebrated his 80th birthday Monday and is running for a sixth six-year term, is in a statistical dead heat with challenger, Dr. Kelli Ward, a family practice physician and former state senator. The Arizona U.S. Senate GOP primary poll was conducted August 27, and included a wide sampling of 780 likely Republican primary voters. The survey has a margin of error of 3.4 percent, which is essentially the margin by which McCain holds a razor-thin lead. The remaining wild cards are the still “undecided” voters who comprise 23 percent of the electorate. With such a stark difference between the vibrant, knowledgeable and conservative Kelli Ward and the gaffe-prone senior senator who favors amnesty for illegals, though he lies about it preceding each election, it’s a surprise “undecideds” exist. Vote! Offer to take a neighbor to the polls. Dr. Kelli Ward has put herself and her family through the McCain wood chipper as she campaigned around the state to give us a choice. Let’s take it! Republican presidential nominee Donald Trump is scheduled to deliver a major address in downtown Phoenix on Wednesday, Aug. 31. His speech, a day after the Arizona Primary Election, is expected to be two-pronged, focusing on both “post-primary unity,” and illegal immigration policies under a Trump administration. As a border state Arizona has long been the acknowledged major portal for smuggled people from myriad countries and illicit contraband, including drugs that make their way into our neighborhoods. Arizona Republicans are eager to hear Donald Trump address their concerns. The “unity” aspect should be interesting since showboater Jeff Flake has publicly stated that “Trump can’t win and shouldn’t win.” Facing a tough election, John McCain, has remained somewhat more circumspect. Conservatives can’t afford to lose sight of the full-circle fact that in 2014 Kellyanne Conway, who previously worked with then-Congressman Mike Pence, made the case to Republicans that the party should embrace a comprehensive immigration bill and legal status for illegals, blandly referred to as “undocumented immigrants.” Conrad, a strategist and pollster, signed on to this FWD.us memo that concluded, among other items, that “Americans overwhelmingly believe the immigration system in the country is broken and that Congress should take immediate action to fix it. “ In fact, America’s generous legal immigration system is not “broken” at all. Only the will to enforce it is. FWD.us is a construct of liberal billionaire Mark Zuckerberg, pushing the fallacy that “we are a nation of immigrants.” In fact, we are a nation of citizens. On a related note, it’s good to see Immigration Counters back online. The go-to source for more reliable numbers than the stagnant 10 – 11 million we have been told are in our country illegally for the past decade. The absurd undercounts don’t reflect births or additional people stealthily crossing into the United States on a daily basis. The Yellow Sheet recently reported that Gov Doug Ducey’s decision to endorse Cathy Riggs in the Desert Ridge Justice of the Peace race did not endear him to incumbent JP Clancy Jayne. Ducey called Cathy Riggs, “Smart, trustworthy and principled.” Riggs is the wife of Frank Riggs, one of Ducey’s 2014 primary rivals. The qualifications for being a Justice of the Peace don’t present insurmountable hurdles. English literacy, Arizona residency, having attained the age 18, being a registered voter and having a pulse are about it. Those minimum requirements and a huge permanent campaign sign on a semi-trailer parked along I-17 heading north got Clancy Jayne elected. Cathy Riggs adds considerably to those minimals, with a law degree and experience as a police officer and detective. Justices of the Peace in Maricopa County currently earn $101,500 — based on a percentage of a Superior Court Judge’s salary. They receive excellent benefits. The part the marginal Clancy Jayne likely revels in the most, is being able to wear black judicial robes. It’s time to put him back in the jeans and denim shirts he previously wore as a rodeo competitor. On her campaign website, Riggs lists the FIVE times Clancy Jayne was reprimanded by the Arizona Commission on Judicial Conduct. You are currently browsing the Seeing Red AZ blog archives for August, 2016.